Everyone goes to Bangkok for all the amazing and authentic Thai food, but if you’d like to try something different on your next holiday to the exotic capital, we’ve got just the place. 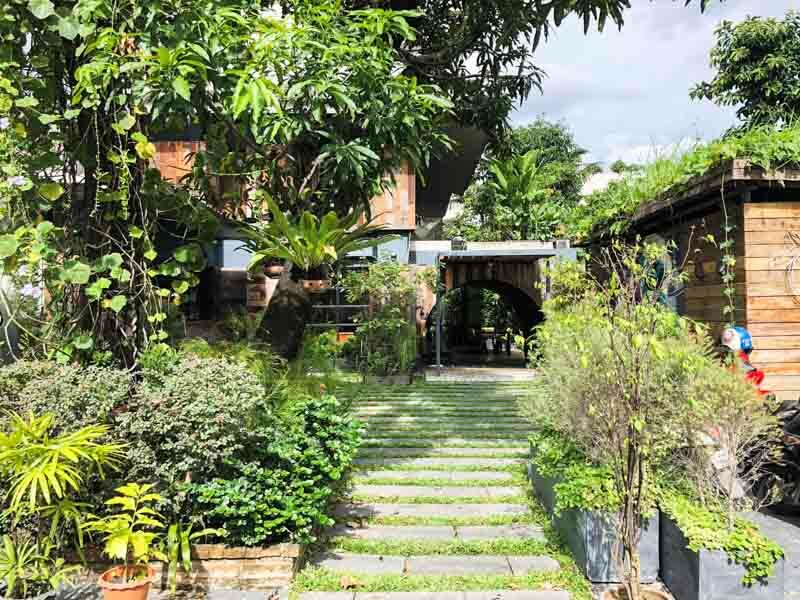 Hidden in the middle of all the bustling, heavy traffic of Sukhumvit is a quaint old house, surrounded by lush greenery. 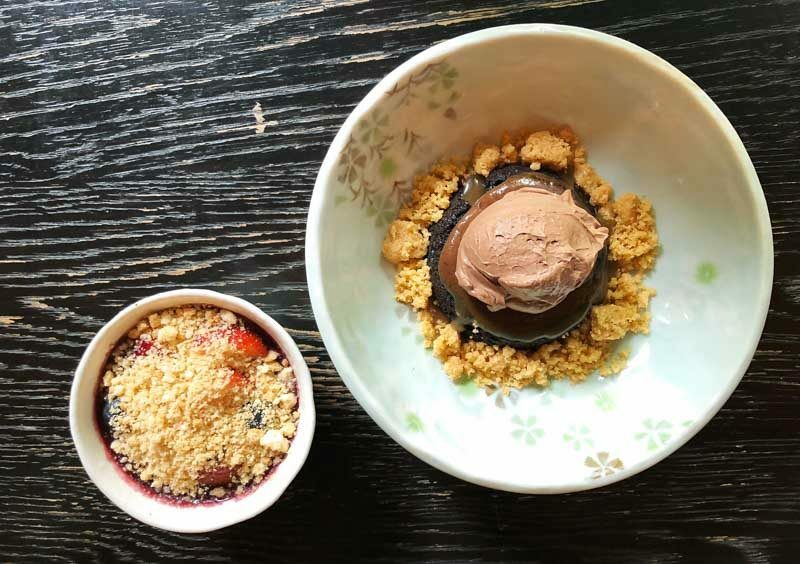 This house is Freebird, a charming bistro that serves up elevated comfort food, helmed by the young and talented Executive Chef, Top Russell. It’s located about a 15-minute walk away from Phrom Phong BTS station, or a 5-minute journey by taxi or Uber. 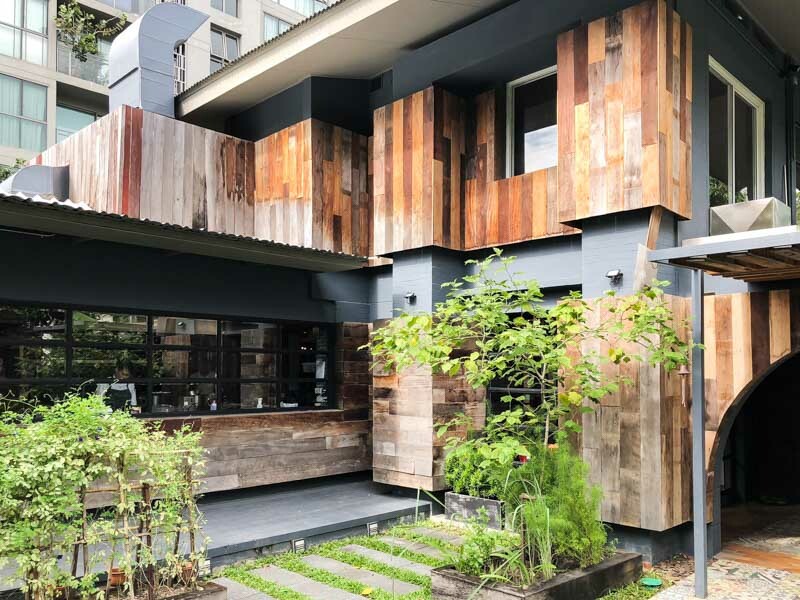 With a mix of recycled and modern furnishings, both the exterior and interior feature a casual and cosy vibe. If you prefer to dine surrounded by nature, choose the outdoor area and you will be greeted by the calmness of the green in the courtyard. Either way, this oasis in the city will give you a bit of a respite from the chaos of Bangkok. 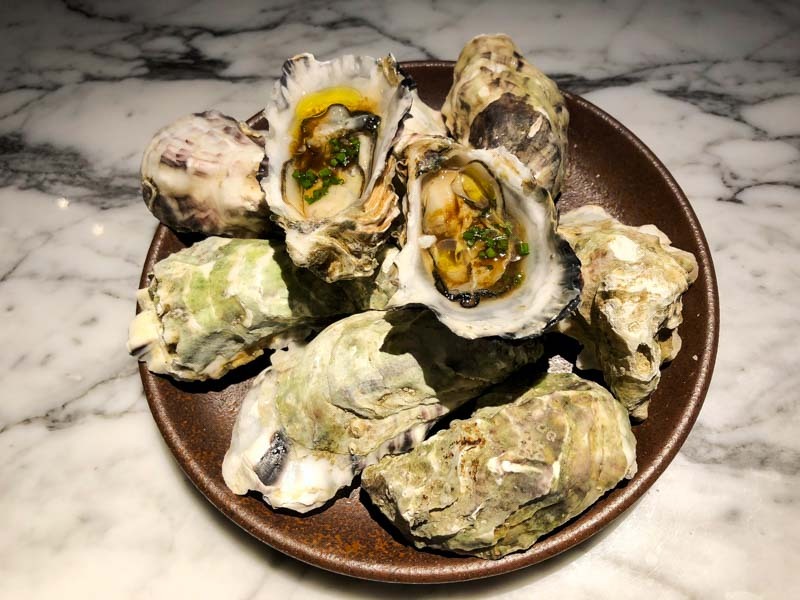 You may be in Bangkok, but at Freebird, you should start with the Oysters with Ponzu and Yuzu (THB 150 per piece) from Normandy. Fresh and succulent, the ponzu and yuzu sauce made it all the more light and refreshing as a starter. 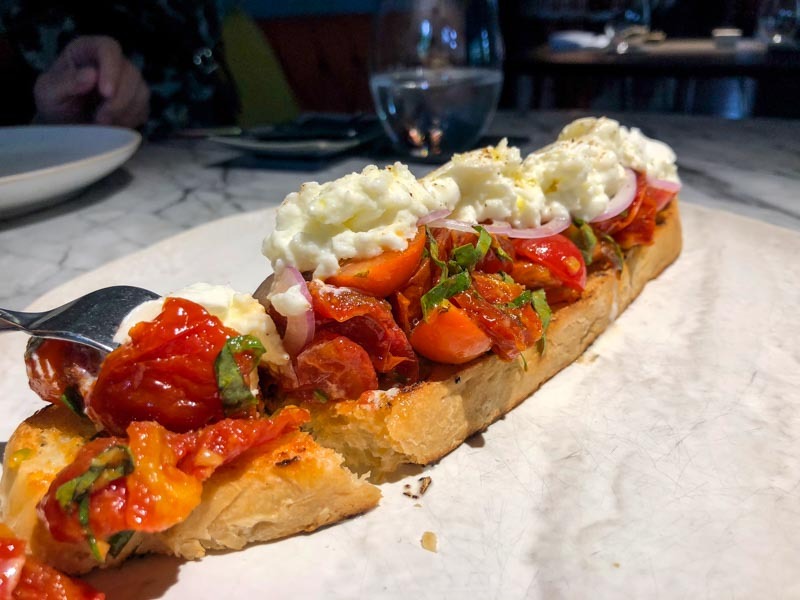 Next up, we tried the Bruschetta (THB 240/ THB 380) which was served with four different kinds of locally-grown tomatoes, shallots and mozzarella. With the tomatoes painstakingly baked, dried and later combined with fresh tomatoes on thin home-baked ciabatta, this was an explosion of tangy sweetness. 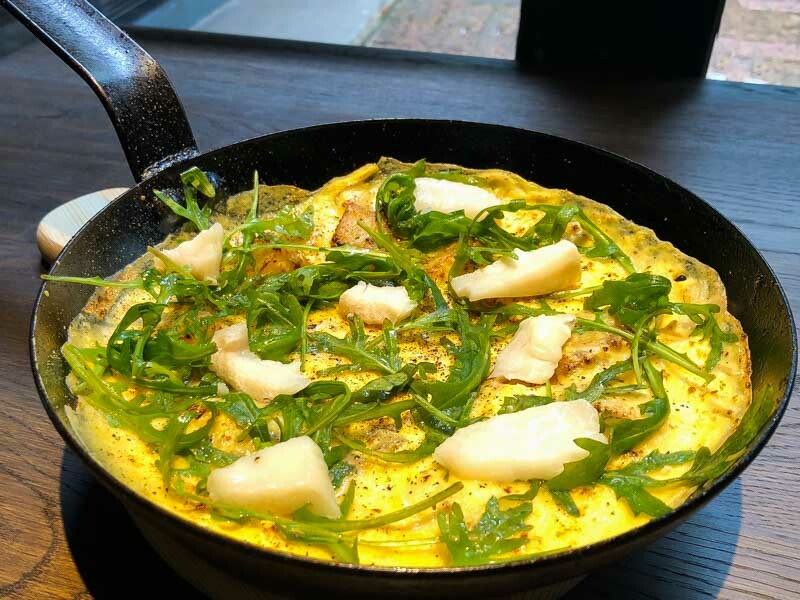 The Baked Frittata with Salted Cod (THB 520, feeds two pax) is a dish to consider if you want something lighter as a main. Each order is created with five eggs baked to perfection. The eggs were soft and fluffy, while the potatoes still had a bit of bite to them. The sweetness from the onions paired well with the salty cod and the nuttiness of the rocket leaves added yet another layer of complementary flavours. 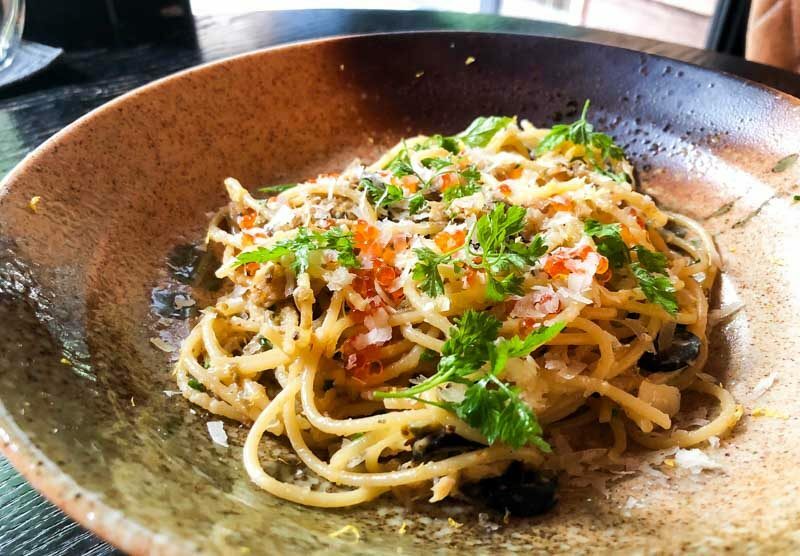 The Crab Linguine (THB 380) (which was served with spaghetti for some reason when I had it) had a generous serving of crab meat tossed in a home-made salted chilli paste and aged parmesan. The mild spiciness provided an interesting taste profile when combined with the ikura popping in my mouth. The only downside was that the combination of ikura and parmesan made the dish a little saltier than was necessary. 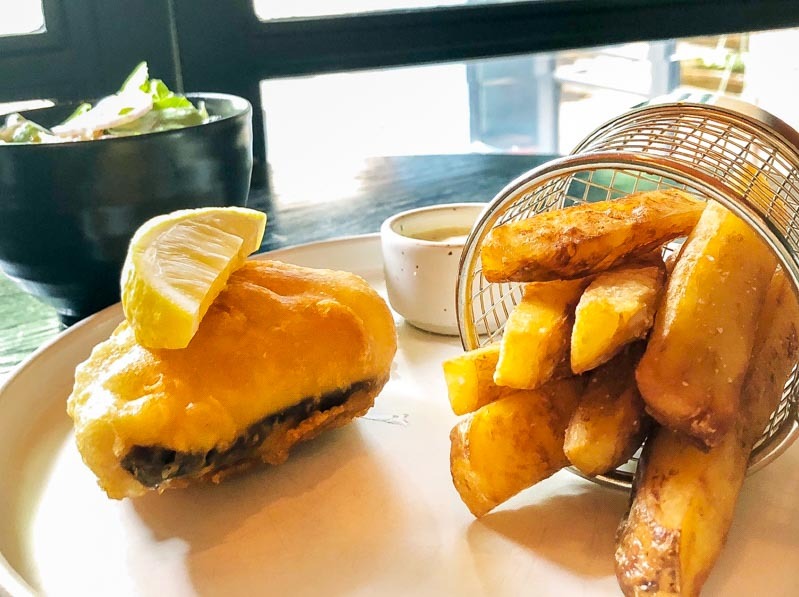 The Fish and Chips (THB 480) was served with a small but thick piece of battered cod. Freshly shipped from Iceland twice a week, the cod had large firm flakes that were delicate and juicy. The thick-cut chips looked ordinary but actually had a lot of effort and time put into them. Each potato is soaked, boiled, then air-fried and finally frozen to retain the flavour. They are thrown into the fryer only when there is an order. The resulting chips were simple and earthy in flavour, with none of that frozen powdery taste. Chef Top surprised us with his interpretation of one of the tougher cuts of beef. 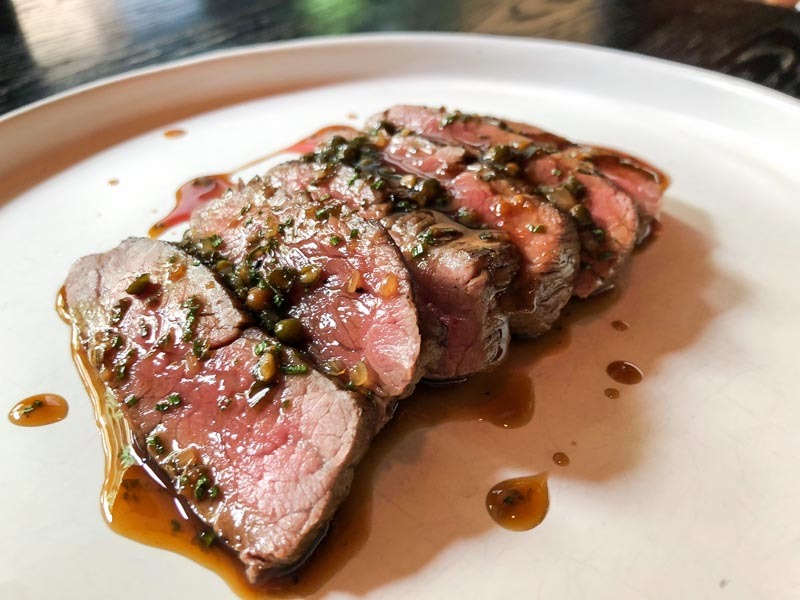 Doused in a home-made peppercorn sauce made with cinnamon, shallots and a dash of brandy, the slices of Jack Creek Flank (THB 850) were juicy and extremely flavourful. The meat still tasted great even after it had been left on the table for a while! End your meal on a sweet note, because we promise you that you won’t want to miss out on Freebird’s desserts. The dessert menu only features four choices, and each one is freshly-prepared and baked only upon order. 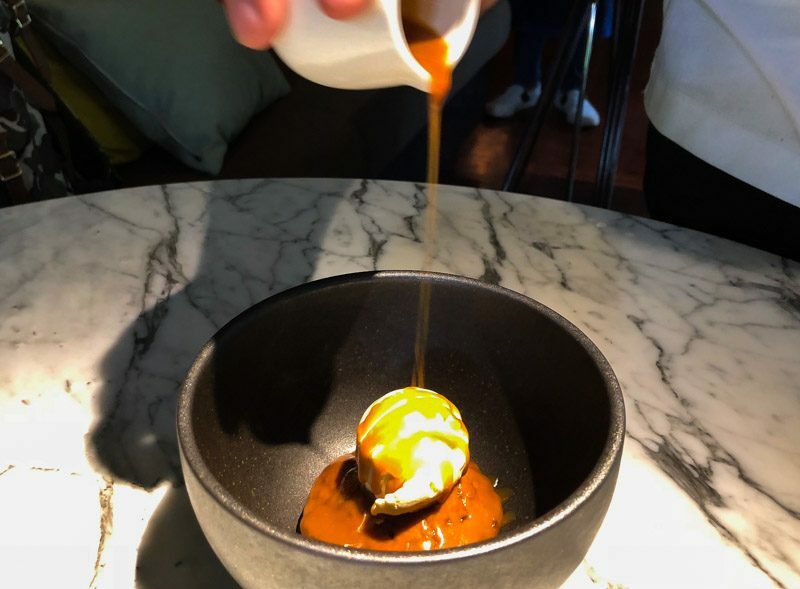 We started with the warm Chocolate Brownie (THB 220) which was surrounded by a sprinkle of home-made peanut crumble with a salted caramel sauce that provided a nice contrast to the sweetness of the brownie. The dessert was also topped with a decadent chocolate whipped mousse – no such thing as too much chocolate, right? Vanilla Panna Cotta (THB 240) is a common dessert found in many restaurants but Freebird’s version came with the right consistency and texture, making for a lighter dessert option. The Sticky Toffee Pudding (THB 260) presented was warm, spongy and moist. Drizzled with a toffee sauce, it was sweet and rich but not exceedingly so. The great combination of warm pudding with cold vanilla ice-cream will leave you happy and satisfied. The slightly savoury Pancakes (THB 220) were thin, warm and yet fluffy. 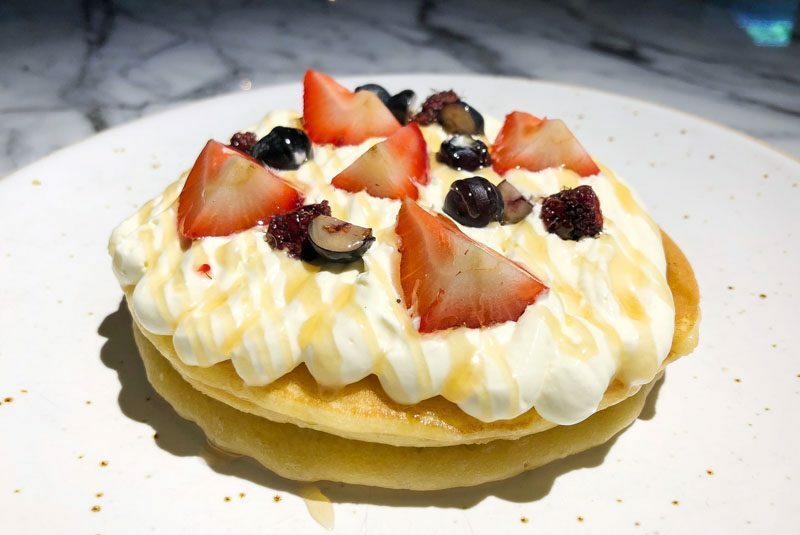 Served with Chantilly cream, honey and some fresh berries, the subtle sweetness and pleasant tang made this classic dessert absolutely tantalising. We appreciated that there was nothing gimmicky about the dishes at Freebird. Using modern techniques and humble ingredients, we were able to taste the harmonious flavours in every bite. Need a little break from Pad Thai and Tom Yum soup? Freebird offers delicious flavours from the other end of the spectrum.